George Gershwin. Cole Porter. Richard Rodgers. Billy Strayhorn. The Golden Age of Popular Song. A bygone era. No one can write tunes like that anymore. 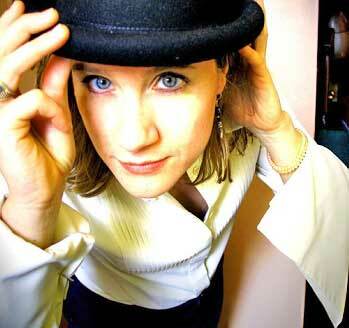 Or has Susan Werner added a new chapter to the Great American Songbook? I Can't Be New (Koch Records), is Werner's fourth nationally released recording, and while chartering somewhat new territory in style, it offers the same high quality writing that her fans have come to expect. Werner performs 12 original compositions in the songbook style. And in this nod to the composers of standards, she's breathed new and brilliant life into the popular song tradition, one that many thought was a closed book. "This is a songwriter's record. I'd describe the aim of this project as Carole King's Tapestry meets Ella Fitzgerald's Cole Porter Songbook," Werner suggests. "I listened to Ella and a lot of Julie London when recording this thing. Julie London, especially, she could read down a ballad so simply and beautifully, you'd just fall over and die." However, Werner cautions, this isn't a record for jazz purists: "The purists want old songs done in a new way,” Werner says. “These are all new songs done in an old way." And if standards have become the measure for all other songs, "It's my secret hope, and I'd be overjoyed,” she adds, “if even one of these songs from the record becomes a standard." A breakthrough singer-songwriter in the mid-90s, Susan Werner has toured with countless luminaries including Joan Armatrading and Richard Thompson. Werner also appeared on the Peter, Paul & Mary Lifelines special seen nationally on PBS. Her 2002 release new non-fiction, received numerous accolades for its insightful social commentary and introspective stories. That's why The Boston Herald said, "If the Grammy Folks knew what they were doing, it would be near the top of the list in next year's Contemporary Folk category." With Werner's musical training (a Master's degree in classical voice) and live reputation as one of the most compelling performers on the touring circuit, writing and singing in such an intimate fashion was a bold departure. "The extroverted performer bends and serves the introverted writer on this record," Werner explains. "It was the most wonderful and rewarding challenge of my career." Werner and Boston-based producer Crit Harmon (Martin Sexton) set an early goal to create an emotionally powerful album filled with songs that engage listeners with beautiful vocals and moving performances, not solos. "Susan's incredible musicianship made my job easier because she could record take after take, each one technically flawless," Harmon says. "This allowed me to push her for versions which delivered the most emotional content." Drawing from a deep well of talented Boston-area musicians, Harmon brought together an elegant team that included legendary clarinetist Billy Novick (David Bromberg), pianist Brad Hatfield (Boston Pops), upright bassist John Lockwood (Harry Belafonte) and drummer Dave Mattacks (Fairport Convention). "I didn't want to reinvent a style that was done 40 or 50 years ago," Harmon explains. "I wanted to make a hybrid statement and avoid any cliché treatment of Susan's songs." Most of all, Harmon is proud of this: "You can't listen to this record without getting a lump in your throat at least once -- and I'm betting it'll be more than once." The remarkable song craft of I Can't Be New is readily apparent, even when simply reading the lyrics. Werner explores the mindset of the ambivalent lover in "I'm Not Sure." "I knew I had a song when I was free-associating lyrics at a typewriter and re-read this line," says Werner. 'cause love is the one drug no one does without love is a cruel drug when it's cut with doubt somewhere, my darling, you'll find love that's pure ~ but it's not mine, cause I'm not sure Sitting in the bleachers at Wrigley Field, watching a game between cross-town Chicago rivals the Cubs and the White Sox, Werner came up with the idea for the wry and melancholy "Stay On Your Side of Town." I get the north side where the brownstones are ~ you get the south side and the big blues bar cross the river and you've come too far ~ stay on your side of town But it's the title track, "I Can't Be New," which sets the album’s tone and exemplifies Susan's shining skill as a lyricist. I can be the sky ~ the very wild blue yonder but I can't catch your eye ~ when it starts to wander as I've seen it do ~ oh, at least a time or two. I'll be anything for you, baby ~ but I can't be new. Other album highlights include the one-night-stand instant classic, "Let's Regret This In Advance," the secretive "No One Needs To Know" and the heartbreaker, "Much At All." Not that there's a dearth of light-heartedness. One only needs to hear the naughty, tack-piano fun of "Seeing You Again," the happy-go-lucky swing of "You Come Through" or the steamy and seductive "Tall Drink of Water" to know Werner covers all the emotional bases. "It's the economy of the Great American Songbook tunes that I admire the most," says Werner. "That's the hardest thing to achieve , to pack all of this feeling, longing, heartbreak or desire into the tiniest song form. It's deceptively difficult." It's also quite possible we've all been deceived into believing the era of the Great American Songbook has come to an end. In creating I Can't Be New, Susan Werner may have sparked something very new , a revival of interest in writing traditional pop songs. And that would be a Great American thing, indeed.